I first discovered Lindt chocolate when I was an unsophisticated au pair in Lausanne; where better to be introduced to it than in its home country of Switzerland? On occasion, Madame B allowed me to try one of her special Lindor chocolates. To a teenager from a small Cornish village, these seemed like the height of chocolate luxury. Even though my palate has matured, I still have a soft spot for Lindor. 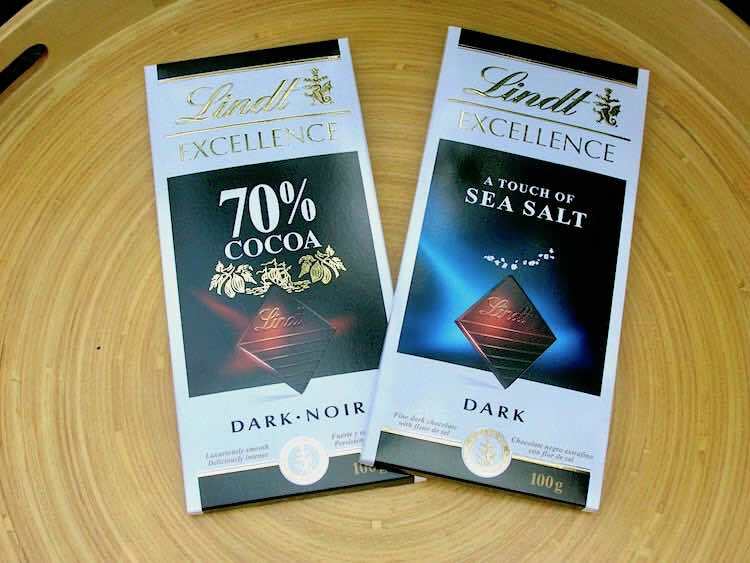 Lindt is well known for being one of the leading European chocolate brands and has been in business since 1845. Lindor was first created in the 1960s. Made in the shape of baubles and with their distinctive red and white wrapping, these started life as a Christmas special. 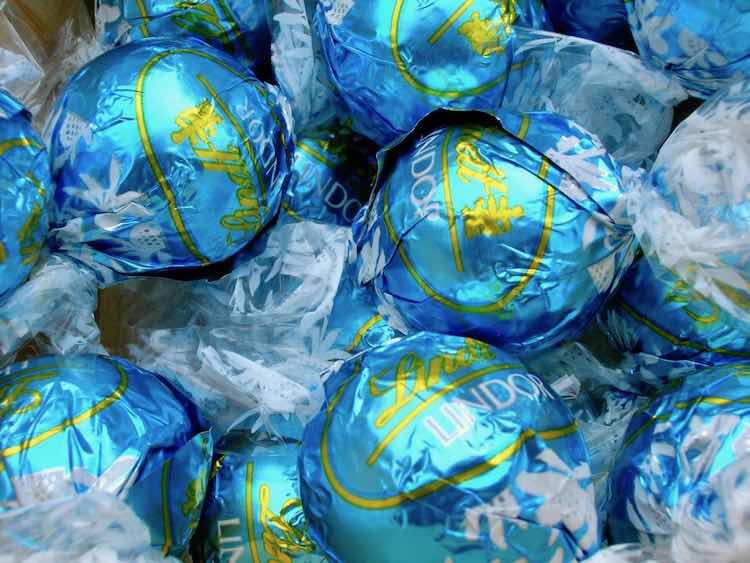 They proved to be so popular that they have been a stalwart of the Lindt range ever since. They are particularly noted for their smooth and creamy centres. 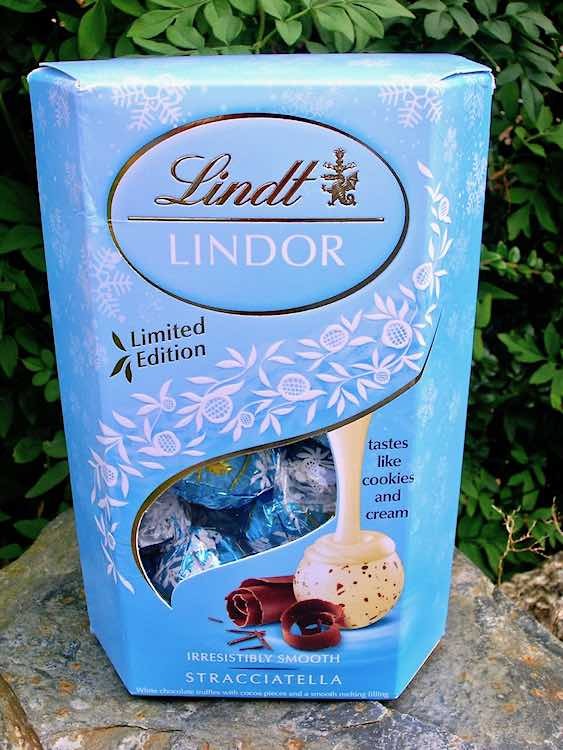 Recently I was sent a Lindor limited edition to review – Stracciatella. With its icy blue and white box and matching wrapping, it conjures up the cold beauty of Switzerland, with its large blue lakes and high snowy mountains. In particular, it reminds me of the spring melt waters rushing from the mountain tops down to the lakes below. From the packaging, you’d almost expect a cool minty flavour, but no, this is almost the opposite, something warm and indulgent: cookies and cream. Stracciatella is named after a delicious Italian gelato, which has fine particles of chocolate distributed through it. Unwrapping the first sphere, the resemblance was clear. A strong aroma of vanilla wafted upwards and the white chocolate shell was flecked with dark chocolate. On biting into it, I realised the dark flecks were in fact cocoa nibs rather than chocolate. These gave a delightful crunch and counteracted the sweetness of the filling. The filling was smooth and creamy as you would expect from a Lindor. It had an almost fruity quality to it and did in fact resemble vanilla ice-cream. I found these to be a welcome addition to the Lindor range. They are currently selling on the Lindt online shop at the special price of £3.25 for a 200g cornet. 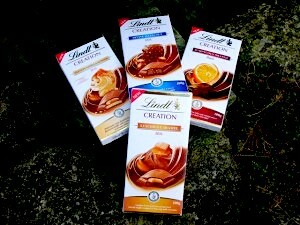 Lindt have released a new range of Creation 100g chocolate bars, which I also got to try. These are filled bars and most contain small pieces of the main flavour ingredient which give an interesting texture and make the experience last longer than it might otherwise do. They are currently selling at the special introductory price of £1.25 from the Lindt online shop. Divine Hazelnut – I think I might just go with the title of this one. This is a milk chocolate bar which is very hazelnutty. It has a smooth praline filling and is liberally studded with pieces of hazelnut. Velvety Vanilla Almond – was my favourite. This has a strong vanilla aroma and flavour. Layers of caramel and cream enrobed with milk chocolate, worked well together and the almond slivers gave a lovely crunchy texture. Luscious Caramel – I do like a good caramel, but combined with the milk chocolate, this one was too sweet for me. I would have preferred a salted caramel to counteract the sweetness and give additional interest. Sumptious Orange – is lush and reminds me of jaffa cakes. The dark chocolate shell helps offset the sweetness of the orange filling. Pieces of orange give added interest to the texture. Summertime and the living is easy – or at least it is when the good people of Lindt send me some chocolate to try. It’s good to ring the changes as well as reacquaint oneself with familiar stalwarts. So as well as a selection of their new fun summer range Hello, it was reassuring to receive a bar of Lindt Excellence 70% Cocoa which I know well. Also included was another Lindt Excellence bar I’ve seen before but never tasted: a Touch of Sea Salt. This dark 47% bar is not for the vegan in your life as it contains butterfat. It is however rather tasty, even if a “touch of sea salt” is a bit of an understatement. I would describe this as distinctly salty. I made some wonderful salted butterscotch chocolate fondants from the “touch of sea salt” bar which I shall be blogging about soon. It worked really well in this bake where the saltiness was a big bonus. 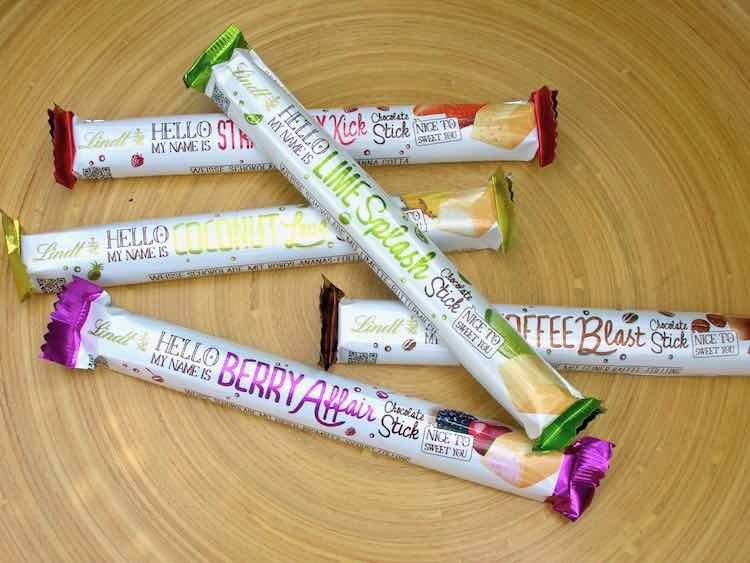 These cute 39g bars are full of punchy flavour in six bite size pieces. The Summer of Love may be more than forty years ago, but there is a breezy optimism in these bars which are a tonic to middle aged cynicism. Coconut Love – white chocolate filled with a coconut cream. As soon as I opened the packet, the scent of coconut pervaded the room. It contained pieces of chewy coconut which gave additional texture – a bit like a Bounty bar, but creamier. There were fruity undertones which I particularly liked. Berry Affair – white chocolate filled with a fruity cream and bits of real cherry and blackberry. The cherry was the dominant flavour, but I got a faint hint of blackberries too. Lime Splash – solid white chocolate with a mouth puckering lime flavour which is tasty and painful both at the same time. A damn fine antidote to the sickliness that too much white chocolate can engender. Strawberry Kick – solid white chocolate with a kick of lime and strawberry bits embedded within. This had a good strawberry flavour whilst being nice and tart; no overwhelming sourness as in the case of the Lime Splash. Most of all, it reminded me of sherbert. It wasn’t too sweet either. This was my favourite bar. Coffee Blast – milk chocolate covering a coffee cream with crunchy pieces of real coffee. Blast is the right word said CT. Being the coffee lover in the household, he got to eat this one. The coffee is good and strong with the bitterness trumping the sweetness and a smokiness permeating through – like a cup of coffee round a camp fire. Enough already, put that harmonica away. Head over to the Lindt website and online shop to buy or find out what else is on offer. If you like this Lindt chocolate review, follow me to find out about future Tin and Thyme chocolate reviews on Twitter, Facebook, Instagram or Pinterest. I was sent these chocolates to try. I was not asked to right a positive review. All opinions are my own, as always. Thanks to my readers for supporting the brands and organisations that help to keep Tin and Thyme blythe and blogging. wow lucky you! Lindt is the BEST! wonderful. The best chocolate on earth is Lindt!! I can see a Lindt fan club forming here. Although, I have it on reliable authority that Italian chocolate is the best. you had me at stracciatella! it’s one of my fave ice creams… now roll a little ball Lincolnshire way will you! Never had the ice-cream. Has that ball reached you yet? Stracciatella’s not for me. From six Lindt truffles flavours that come in a big box this is my least favourite flavour after the white chocolate one. I don’t like the Stracciatella gelato either, don’t know quite why, just cannot pinpoint what I dislike about it, I guess I just don’t like the white chocolate. Yum. agree about salted caramel though :-). It’s funny those former experiences that stay with you – I au paired in France for 6 kids, and madame had a very strict rule that after lunch the kids went off for a siesta while she (and I) would drink a cup of coffee and allow ourselves one delicious chocolate (from which ever box she had open at the time) in peace and quiet. I have been known to raid the cooking chocolate box when the need to emulate her strikes me! Now that sounds very civilised. You must be an expert on French chocolates. Bet it was tough looking after six kids though. I only had two and that was pretty full on. What nice flavour combinations, vanilla and almond sounds very good. I have not seen these yet in the shops. Yum. I don’t like crunchy bits in chocolate – prefer them smooth so I don’t think I’d like the Stracciatella. But I do like the blue colour, rather than the red. Never new Lindt did bars like this… ver yinteresting!